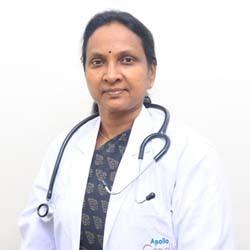 Dr. Prameela Sekhar K is a Gynaecologist and Obstetrician in Apollo Cradle, Kondapur Hyderabad and has an experience of 30 years in these fields. Dr. Prameela Sekhar K also practices at Apollo Hospitals in Jubilee Hills, Hyderabad and Apollo Cradle in Jubilee Hills, Hyderabad. She completed MBBS from Gandhi Medical College, Hyderabad in 1985, DGO from Osmania Medical College, Hyderabad in 1998 and DNB – Obstetrics & Gynaecology from Diploma National Board in 2001. She is a member of Member Of Obstetric & Gynaecological Society, Hyderabad and Member Of Obstetric & Gynaecological Society, Mumbai. I had an excellent experience at Apollo Cradle. Special thanks to Dr. Prameela Shaker for comforting me with the best professional services. I appreciate the entire team for the great efforts for making my delivery a safer one. I was referred to Dr. Prameela by one of my friends. I will always be thankful to her for doing so. I had never seen such good care and services. I will be thankful to Apollo Cradle for giving me the best. Mrs.Sushma – Jubilee Hills, Hyderabad. Amazing experience, amazing staff, amazing birth, highly recommend! I visited Apollo Cradle for my delivery under the care of Dr Prameela Shekar, who was a god sent. She is such a gentle soul and one of the best doctors ever. She made sure I had a safe delivery and made it so memorable. My deluxe room was huge and came with a TV and AC. My experience with Apollo was great. Mrs.Priyanka kumari – Jubilee Hills, Hyderabad. A friend of mine told me to visit Apollo Cradle as they have good doctors. I visited this facility for observation and was treated by Dr Prameela Shekar. She is one of the best doctors I have ever come across and the hospital has a great team. I’m also extremely grateful to the team for the advocacy and attention. The ambulance also arrived on time and the vehicle was very clean. The deluxe room was comfortable and clean. Apollo Cradle, Jubilee hill is one hospital that I would surely pick in the future for all my treatments. I am very impressed by the services extended by Apollo. The efficiency of the staff, including Dr Prameela Sekhar, nurses, administration, and housekeeping is commendable. They ensure the patient comfort at all times. The entire property is kept squeaky clean. I’d definitely recommend Apollo to my friends and family. I came to Apollo Cradle for my delivery under the care of Dr Prameela Sekhar and I can say without a doubt that the Apollo hospital offers great services and treatment. During the course of my stay, I received excellent services by the staff. The doctors and nurses are very supportive and take complete care of you till you recover. The meals provided were also satisfactory. I’d surely recommend it. I chose Apollo Cradle, Jubilee Hill for the delivery of my child under Dr Prameela Shekhar. I can say without a hint of doubt that I am thoroughly satisfied with the services extended by Apollo and its staff. From the front office to doctors and nurses, the staff is skilled and know their duties well. Hygiene is taken proper care of. The only concern was the food as there were limited options and quality too was just satisfactory. I would surely recommend Apollo to friends. Apollo Cradle, Kondapur is a good hospital with a very hospitable environment. Right from admission to the discharge and billing, we didn’t face any inconvenience. The property is hygienic. Meals are provided on time and they are of good quality. Dr Prameela Sekhar is very kind and takes complete care of the patient. I came to Apollo Cradle, Kondapur for my delivery under Dr Prameela. My experience here was really good. The package was explained to us thoroughly by the PRO, prior to admission. We picked the Deluxe single room. The room was clean and had all basic amenities. The TV and AC were also in good condition. The staff here is very responsive and ensures that you do not face any issue. I’d surely recommend Apollo to my friends. It was a very good experience overall and we really enjoyed our stay at Apollo Cradle. The service of the hospital; the doctors, staff and housekeeping was very good. Thanks to all. Excellent service and staff. We were delighted with the service of doctors , nurses, front desk, pantry, and housekeeping. Extremely satisfied to deliver our bundle of joy at Apollo Cradle. Thank you. The service at Apollo Cradle is really good. I am lucky to get a healthy baby boy. I thank everybody at Apollo Cradle for taking good care of us and wish you all good luck for the future! We had not imagined such a smooth and seamless treatment here in Apollo Cradle. We would love to spread the word to all the expecting parents, they must choose to consult in Apollo Cradle. Thank You Apollo Cradle, I loved my experience here. I was happy to choose Apollo Cradle as the hospital to welcome my new-born. The accommodation was good, and all the doctors and staff members are very supportive. Special thanks to Dr. Prameela Shekhar and staff, Bushra for being so cooperative and giving me a comfortable, good experience at Cradle. It was good to see that all the staff members in Apollo Cradle, whether nurses, front desk, or housekeeping are very good. Of course, the doctors are very renowned and experienced, so it was always assuring to interact with them. Thank you Apollo Cradle for treating us so well. It was a wonderful experience for my family to visit Apollo Cradle. We received great care from all the doctors and staff members. Thank you for providing such wonderful facilities, and such excellent support in the form of your staff. Appreciate it. Thanks a ton to Apollo Cradle for their hospitality and support. From the facilities and procedures to the entire staff, we received great treatment and support. Last but not the least, special thanks to my doctor, Prameela Shekhar. It was a great experience, having my delivery here at Apollo Cradle. The C- Section went smoothly and the staff was very supportive during my recovery period. Just at the push of a button my baby was fed, changed and taken care of by the sisters in a very loving manner. Happy to have chosen Apollo Cradle. We were happy to choose Apollo Cradle, as we had such a great experience with our first child here. The doctors were very helpful and kind, nurses were gentle and available at all times, and of course they were all very kind. All departments including housekeeping & management were good and helpful. Special thanks to Dr. C V S Lakshmi (Neonatologist) Dr. Prameela Shekhar and team (OBS) for your expertise and care. I was very happy with the Apollo Cradle family. For one of the greatest days of my life, everyone in the staff made my delivery and stay very comfortable. Thank you, Dr. Prameela Sekhar, and everyone in the Apollo Cradle team. As the tag line says, Apollo Cradle really delivered joy in a very humble and caring manner. The doctors, nurses, staff, all the processes and everything else are excellent. All the best. It was a really great experience at Apollo Cradle. From the ambience to the facilities and the staff, we thank you for making our stay so comfortable.